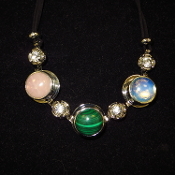 This Multi-stone necklace consists of Rose Quartz, Malachite, and Opalite. It is 18 inches long but has an extender to adjust the size. This item ships free anywhere in the continental USA. This Multi-stone necklace consists of Howlite, Black Onyx, Unakite. It is 18 inches long but has an extender to adjust the size. This item ships free anywhere in the continental USA. This Multi-stone necklace consists of Opalite, Amethyst, and Howlite. It is 18 inches long but has an extender to adjust the size. This item ships free anywhere in the continental USA. This Multi-stone necklace consists of Opalite, Rose Quartz, Unakite. It is 18 inches long but has an extender to adjust the size. This item ships free anywhere in the continental USA. This Multi-stone necklace consists of Rose Quartz, Amethyst, Unakite. It is 18 inches long but has an extender to adjust the size. This item ships free anywhere in the continental USA. This Multi-stone necklace consists of Malachite, Unakite, and Rose Quartz. It is 18 inches long but has an extender to adjust the size. This item ships free anywhere in the continental USA. This Multi-stone necklace consists of Rose Quartz, Unakite, and Howlite. It is 18 inches long but has an extender to adjust the size. This item ships free anywhere in the continental USA. This Multi-stone necklace consists of Howlite, Rose Quartz, and Unakite. It is 18 inches long but has an extender to adjust the size. This item ships free anywhere in the continental USA. This Multi-stone necklace consists of Howlite, Amethyst, and Unakite. It is 18 inches long but has an extender to adjust the size. This item ships free anywhere in the continental USA.